This autumn I’ve been busy talking about cybercrime, data breaches and online safety, but let’s not forget about the need security in real life too. October is National Home Security Month, the last week of which is Smart Home Security Week. 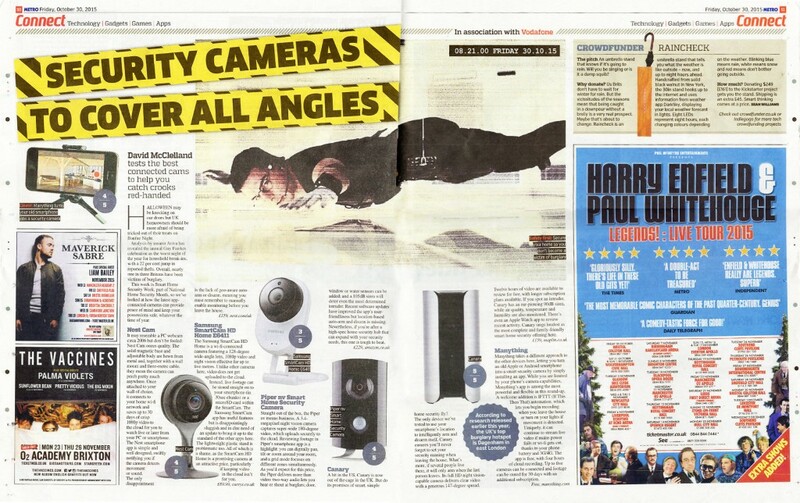 Writing once again for The Metro newspaper I revealed six app-connected cameras for your connected home that give you piece of mind and, if necessary, help to catch crooks red-handed. Amongst those I reviewed were flyaway Kickstarter success story Canary, home security heavyweight Piper nv and the innovative app-only Manything, which helps you to put to old smartphones to good use. This entry was posted by David on October 30, 2015 at 10:00 am, and is filed under Writing. Follow any responses to this post through RSS 2.0.Both comments and pings are currently closed.